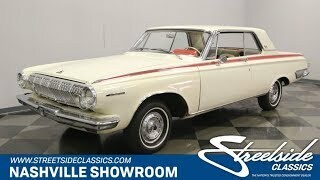 Hi, I am interested in your 1963 Dodge Polara (stock #1240-NSH) listed on Autotrader for $35,995. I'd like to get more information about this vehicle and confirm its availability. Original, authentic and beautiful are a few of the words that describe this car. It has had only 2 owners since it was new and they kept everything from the original sales brochure, window sticker and owners-manual as well as receipts of the services performed along the way. If your preferences tend toward classic cars that are extremely well documented and original, we think you will find this car very appealing and are likely to become its 3rd owner. Check it out. Dodge did a great job when they redesigned the 63 model to be smaller, lighter and more sculpted than its predecessor. The original owner of the car also did a great job in selecting the color of Polar White with a Red accent down the side. Of-course being a mid-sixties car means that there is some beautiful chrome dressing it out too. At the front of the car a segmented grill of vertical bars leads the way with two of the four headlights set into it underlined by a sharp looking chrome bumper while the other two headlights are perched on the ends of the fenders with chrome bezels. The fender wells and rocker panels are trimmed with chrome piping and Polara appears in script on the front fender with 500 gracing the sail panel and the Red accent down the side is outlined in nicely polished stainless. The back of the car kind of starts on the side with a piece of polished trim blending into a simple and clean looking rear bumper that wraps around and under the chrome trimmed taillights. Open the door and you will find an all original condition interior in Alabaster and Red. It is in great shape with just a little bit of wear and fading as is expected and which are marks of pride in a survivor interior. The door panel alternates white and red with thin chrome piping outlining it. The front buckets have pleated red seating surfaces accented in white piping with alabaster bolsters surrounding it, and there is a center console between them. The two-spoke steering wheel is also red and white with a full circle chrome horn ring and Polara badge in the center. Behind it is a completely stock dash panel that is in excellent condition with the rectangular speedo on the top and smaller rectangular gauges below it. The automatic transmission is controlled by those wonderful push button selectors which are mirrored on the other side by ventilation buttons in the same style. The original AM radio is still in place with a speaker in the sculpted dash just above it. Open the hood and you will find an all original engine bay with the original 383 nestled down inside it. The motor, like the interior, is proud to show off its survivor credibility rather than getting all painted up and dressed up as part of a restoration. From the original black air filter assembly through the carb, intake, heads and exhaust manifold, it is all authentic and stock. There is a fresh set of mufflers and pipes on the car, and again, there is a whole notebook full on maintenance records with this car so you can see exactly what has been serviced, when, where and how. Power flows back through a Torqueflite three-speed automatic transmission to the rear wheels mounted on leaf springs. Up front, control arms and torsion bars work with the power steering to provide good handling. The rubber meets the road through 215/70R14 white wall tires mounted on steel wheels with the original hub caps. Extremely well documented, authentic, original, and beautiful. This car is looking for its 3rd owner. Would that be you? Call or come on down and check it out.